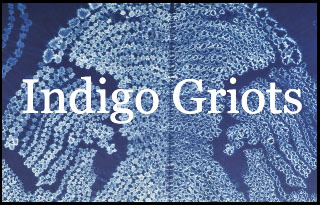 Indigo Griots: Montréal is an intermedial (analogue -> digital and back again) lattice of exhibition, performances, artist talks, workshops, demonstrations and guided studio visits all taking place at Espace Fibre’s dye studios & exhibition space, in Pointe Ste. Charles; 2 blocks from the Charlevoix metro, 1 block from the Lachine canal bicycle path. The central threads of our presentation are the dyer’s obsession with the magic of colour and pattern; how magic and personal stories are entwined with collective memory. Our binding power is Indigo, elemental power, a diety so love-filled, once Indigo grabs a’hold of a heart it never lets go. Blending residue of Fire (Ash), Plant cakes, Water and Heat we try to catch Magic on our Cloth. Valérie d. Walker in collaboration with Espace Fibre Artists Helene Brousseau, Natalie Tremblay and Jessica Lemus-Coto, presents an immersive, large scale, Labyrinthine installation of Indigo dyed cloth-panels embedded with layered meanings. In the labyrinthe are projections, onto cloth, of video extracts from the Indigo Griots, Minneapolis 2011, performance featuring shakuhachi flute and “tellings” by Mr. Douglas Ewart, mixed with griots experiences in Montréal around the dye pots. ⁃ A total of three (3) Indigo dyeing workshops will be offered in EspaceFibre’s Sun-filled Dye-Kitchen. The Indigo dyeing workshops will introduce various types of Indigo such as: Japanese sukumo or Polygonum Tinctorium, Bengali Living Blue Indigofera Tinctoria, and 100% micro-perl, all using enviro-friendly, non-toxic methods of reduction and creation of an alkaline environment. All natural dyes are sustain-ably produced and obtained via fair-trade relationships. This entry was posted in En avril, Event, Exhibition and tagged Exhibition, Indigo Griots, Valerie Walker. Bookmark the permalink.